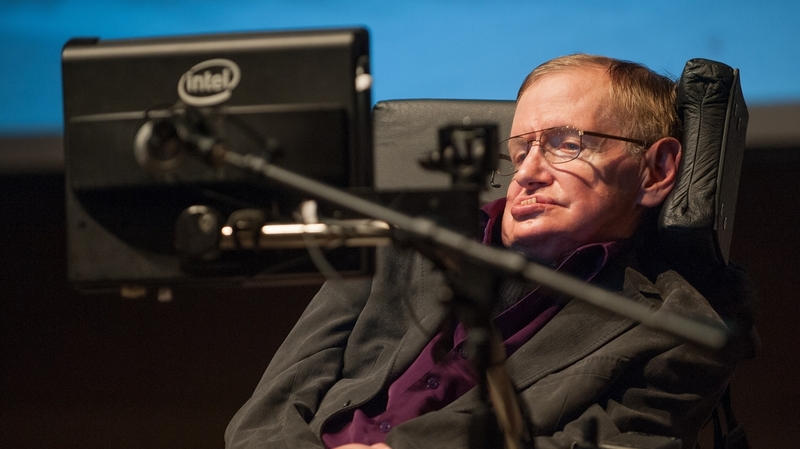 Stephen Hawking Has A Guest Vocal On Pink Floyd's New Album : The Two-Way The famous cosmologist will appear on the track "Talkin' Hawkin' " on the upcoming album The Endless River, set for release next month. It's his second inclusion on one of the band's songs. British cosmologist Stephen Hawking gives a talk to workers at Cedars-Sinai Medical Center in Los Angeles, in April 2013. Stephen Hawking will bring his iconic synthesized voice to Pink Floyd's new album, The Endless River, set for release in November. It's the famed physicist's second collaboration with the British band, having appeared on the 1994 track "Keep Talkin' " from The Division Bell. Rolling Stone says the new song, "Talkin' Hawkin,'" will not be a sequel to the earlier track. Of course the 72-year-old cosmologist is no stranger to pop culture, and has left an enduring mark on the celebrity landscape. He's appeared on television shows ranging from a cameo as a hologram of himself as a poker player aboard the Enterprise in Star Trek: The Next Generation, to an object of fawning adulation for the geeky cast of The Big Bang Theory. He also did voiceovers for cartoon versions of himself on The Simpsons and Futurama. Biographile says of Hawking: "As a pop culture figure, Hawking has been both lionized and the subject of ruthless satire — sometimes a little bit of both. In an episode of Seth MacFarlane's always controversial animated series Family Guy ("Brian Goes Back to College," season four, episode 15) Hawking is portrayed (humorously) as an abusive, ill-tempered professor. Humorist Stephen Colbert has a recurring bit ... in which he satirically rails against an egomaniacal Hawking." In a documentary on Hawking's life that aired on PBS earlier this year, the physicist "reveals that the great man has indeed relished probing the limits of knowledge; but what really seems to excite him is the applause he has elicited from the rabble," The Guardian wrote ahead of its release.